I spoke with Living Magazine about the joys of living in Birmingham. Read the full article here. With the BBC entering one of the most challenging periods it has ever faced, the Creative Industries Federation is holding three events to investigate the role of the Corporation in the creative industries and what any change in its scale and scope might mean for British cultural life in the future. We want to hear from the diversity of our membership – from orchestras to video gamers and dancers to movie-makers and recording labels. The aim is to gather evidence that will form part of a submission to the Government’s Green Paper review. There will be round-table discussions in Manchester and Birmingham followed by an event with an expert panel, and discussion from the floor, in London, kindly hosted by King’s College London. Members will be given priority. Bringing together the creative industries community in Birmingham, across the public and private sector. Here are some messages from last year that are as relevant in 2015 as we grow the creative economy in Birmingham and the West Midlands region. Last year the Young and In Brum article in The Drum magazine highlighted our direction of travel and this year we really are gearing for a bigger growth in the creative economy. The West Midlands is at the centre of a creative jobs boom with over 20,000 new roles in just three years 2011-2013. This increase has been hailed as evidence that the region, traditionally known as a manufacturing heartland, is also able to attract and nurture creative firms, particularly those in the IT and computer software industries. The number of jobs in the creative industries rose from 78,000 in 2011 to 94,000 in 2013 in the West Midlands, an increase of 20% over three years. In the same period, the overall total number of jobs in the region rose by just 3% illustrating the key role creative industries can play in creating wealth and employment in the region. The biggest rise was in IT, software and computer services, where employment shot up from 29,000 to 43,000, up by 48%. There was also a significant increase in jobs in music, performing arts and visual arts, up from 10,000 to 12,000. And the number of jobs in film, TV, video, radio and photography rose from 6,000 to 9,000. Almost a quarter of the UKs Computer Games workforce is located in the region. We know about Codemaster, but what about “Team Football” who have an official contract with Fifa or “Flix Interaction”, they are helping this sector to grow and are putting us on the international stage. It is estimated that tax breaks on video games production launched last year will create more than 5,000 UK jobs but these jobs will not just fall into our region we have to find, nuture and grow new developers if we want to be in this particular game! Other parts of the country have also seen an increase in creative jobs but the national rise is just 10% over three years compared to our 20%. Congratulations to BBC Midlands Today celebrating 50 years of broadcasting this year. 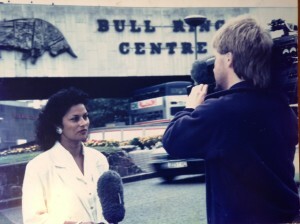 Here I am reporting from the old Bullring many years ago. Ideas and creativity turns base materials into world class products – the creative industries are vital in all sectors of the economy including exports, attracting £1.25 Billion to the local economy. Birmingham’s cultural and creative sector is now ready to step out of the long shadows cast by London, Manchester and Liverpool’s reputation for creativity, culture and performing arts; spearheaded by the city’s own home-grown creative talent. Recent government figures suggest that the West Midlands is experiencing a creative boom with almost 20,000 new roles in the past three years. The number of jobs in creative industries rose from 78,000 in 2011 to 94,000 in 2013 in the West Midlands and increase of 20% compared with a 3% rise in the overall number of jobs across the region demonstrating the key role the creative industries are playing in creating employment, growth and wealth across the region. Birmingham is ideally situated to capitalise on the exponential growth within the creative sectors. The West Midlands youthful demographic with 40% of the population in Birmingham being under-25 – possibly the youngest in Europe, has a young talented workforce ready-made and good to go. The region benefits also from a large British ethnic minority population who, statistically are more likely to be employed in the key IT and computer software industries creating a perfect fit for the technical demands of the creative industries. While the statistics and evidence paint a positive picture, MP’s have warned that the region’s growing success story is at risk, due to lack of support for small and medium sized companies creating a brain drain to London and other large UK cities. One of the issues the creative industries face across the region is recruiting and retaining graduates, the number of work ready graduates across the West Midlands is 28%, compared nationally with 38% and 48% in London. So what is to be done to capitalise and harness this booming sector to create wealth and retain talent within the city? Greater Birmingham and Solihull Local Enterprise Partnership (GBSLEP) recognise the value of this growth sector and as part of its overall strategy to accelerate economic growth in the cultural and creative economy and to increase jobs, GVA and the city’s reputation as a creative region. The Creative City Partnership (CCP) was set up to promote the development of jobs and wealth in the LEP area. It is an umbrella group that helps yoke together the technology, arts, culture and the creative economies, to give a joined up compelling narrative for the area. The CCP have recently released a far reaching business plan that aims to the young create 5000, new jobs, a further 5000 supporting jobs and 500 apprentices by 2020 in addition to supporting growth across the sector. “Our mission is to find new ways to support the sustainability of the small and medium-sized companies, only if they are strong will they in turn are able to support the growth of others”. We need to capitalise and recognise our strengths in IT, software and computer services in terms of jobs. We need to work with our universities, the Arts Council, BBC and other partners have a key role to play in developing and harnessing regional talent, particularly in the performing, visual arts and music. I have mentioned the importance of retaining our graduates but let’s not forget our FE sector; we often treat them as the poor relation and don’t see their potential to become a big player in development and delivery. Success overseas is growing but is limited. We need to tap more into what UKTI is doing. UKTI’s figures show that we should pay more attention to the job creation and business potential overseas. To achieve our mission to ensure amongst other initiatives, we have to improve networking, develop the right type of infrastructure, support the horizontal supply chain, improve access to finance, grow new markets and raise our profile, we are very poor at telling our story, perhaps we just don’t believe enough in ourselves. The creative industries are no longer the icing on the economic cake but we are part of the main body of the cake. We are Young, Diverse and Digital what an amazing strapline for any city!